A Chicago Tribune Best Children's Book of the Year! Weak, sick, and hungry, a tabby cat seeks shelter in an old barn, where the mice take pity on her and make her a warm, cozy bed in the straw. . . But as soon as she feels better, Marmalade the cat begins doing what cats do: chasing the mice! 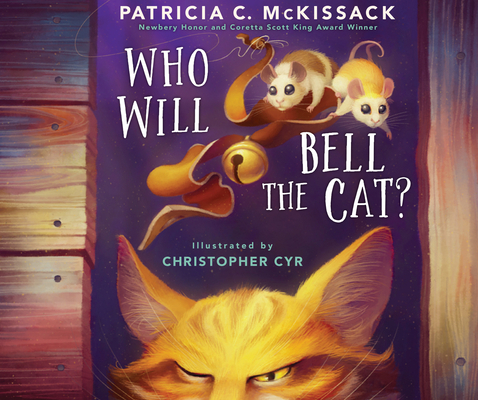 When Smart Mouse stumbles across an old bell, the mice hatch a plan to make sure Marmalade can never sneak up on them again... but who will be able to get the collar onto the cat? Retold by a master storyteller, this tale is brought to life by bold illustrations of gentle mice, cozy barn corners, and of course, the magnificent feline rage of Marmalade on the hunt. A perfect read-aloud for winter days. Patricia C. McKissack (1944–2017) wrote more than one hundred books for young readers, often with her husband, Fredrick McKissack. She won the Coretta Scott King Medal three times and was an Honor winner six times. She also won a Newbery Honor Award. Christopher Cyr is an artist from New England. He graduated from the Rhode Island School of Design and is also trained in animation.